Our popular holiday picture book edition is now a beautiful board book for toddlers. 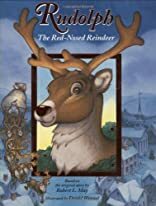 With rounded corners, metallic ink on the cover that spotlights Rudolph's glowing nose, and 20 sturdy board pages, this is a lovely and affordable abridgement of the Robert L. May classic. 11/22/2010 Kayli Thomas said: Hey bought this off of Ebay and i am trying to see if its a first eddition, all it says XXXIX for copyright..? anyone know?